We generally think of, and refer to, avocados (Persea gratissima, Persea americana) as vegetables, but they are the fruit of a subtropical tree, native to Mexico and South America. The tree is a member of the Laurel (Lauraceae) family and there are approximately 500 varieties, which produce fruits ranging from small and egg-like to heavy, pear-shaped fruits. The Aztecs believed the avocado had aphrodisiac qualities because of its shape. Cold-pressing the flesh of the avocado makes avocado oil. It takes ten fruits to produce one teaspoon of the rich and thick oil. This oil absorbs easily and it is full of beneficial fatty acids and vitamins. Avocado contains more than 20% essential unsaturated fatty acids, vitamins A, B, C and E, proteins, lecithin and potassium (the latter of which is sometimes called the ‘youth mineral’). In the US, avocado oil is patented as a treatment for some forms of dermatitis and arthritis. It is reported that long-term treatment with avocado oil can help to relieve eczema. 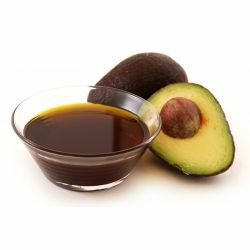 Avocado oil is reputed to be beneficial in reducing age spots and the appearance of scars because it has a high content of unsaponifiables (sterolins) that soften and moisturise skin’s upper layer. It is also recommended for fine lines and wrinkles and is said to help protect skin from ultraviolet rays. We use avocado oil in our The Soft Touch body butter, which is a nourishing treatment for the hands. You can, however, use it all over the body in the shower to feed your skin with eight moisturising oils. Unruly or dry hair will benefit from avocado; rich and nourishing, it helps to add strength and shine and conditions the hair, too. We use avocado oil in our Retread hair conditioner to add weight, soften the hair and to restore shine.